The first floor is accessed via an open staircase from the lounge diner. 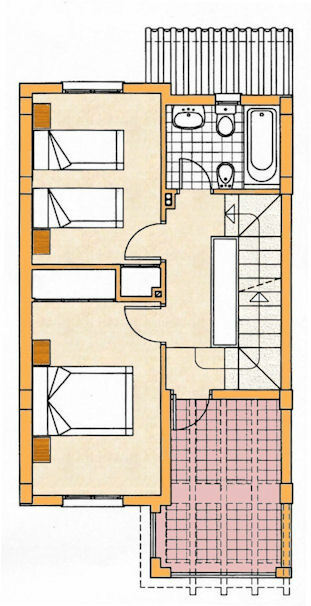 On the first floor is the master bathroom, with bath, shower, toilet, sink and bidet. The air-conditioned master bedroom has double bed, built in wardrobes, large bedside cabinets, chair and telephone. The twin bedroom has two single beds, built in wardrobe, bedside cabinets and cooling fan. 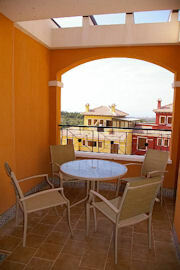 Also on the first floor is a south facing patio area with table and 4 chairs. Perfect for early morning tea or a late nightcap before bed.